All organisations with 250+ staff were due to report on their gender pay gap by 4 April 2018. The UK Government has published the full data set of organisations submitting gender pay gap information. This data was matched against a list of the top Scottish charities, downloaded from OSCR. 78 Scottish charities were identified, of which 53 are third sector charities. The other charities are treated as separate from the third sector due to a statutory remit or restricted public benefit. These include: Arms-Length External Organisations (ALEOs) such as leisure trusts, Universities and Colleges, and private schools. Scottish charities are leading the way on equal pay. The mean pay gap for Scottish charities is 5.03%, smaller than the UK charities pay gap of 8% in favour of men. The median pay gap for Scottish charities is 1.7%, again smaller than the UK charities median pay gap of 8%. 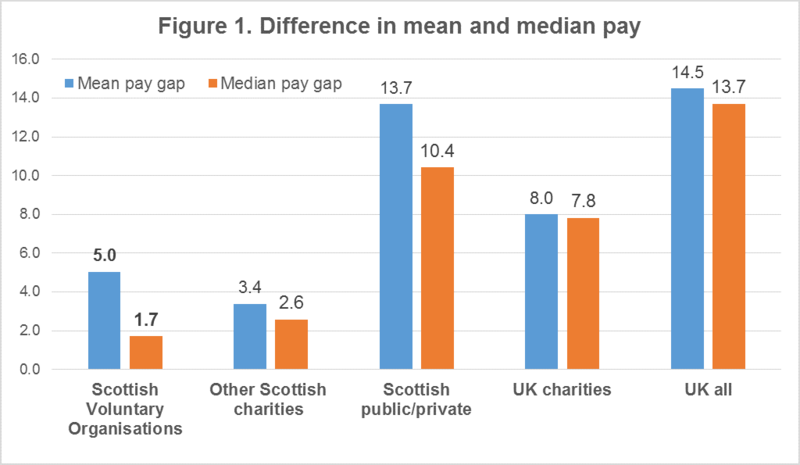 Both the mean and median pay gaps of Scottish charities are significantly below that of the other Scottish sectors, which have a mean gap of 13.7% and a median gap of 10.4%. 53 qualifying Scottish charities were analysed, employing a total of 40,190 staff. Women working for these 53 large Scottish charities are on average paid 5% less than men – in other words, on average, for every £1 a man earns, a woman earns £0.95. 7 in 10 Scottish charities (71%) have mean pay gaps in favour of men. 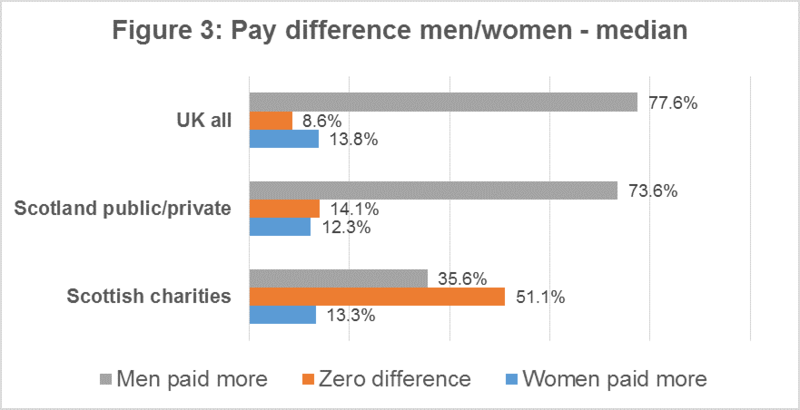 3 in 10 Scottish charities (28.9%) have mean pay gaps in favour of women (figure 2). This shows greater equality than both the rest of the UK (11%) and Scotland (17%), but also UK charities (20%). Using median figures, just over 1 in 10 Scottish charities (13.3%) have pay gaps in favour of women (figure 3 below). 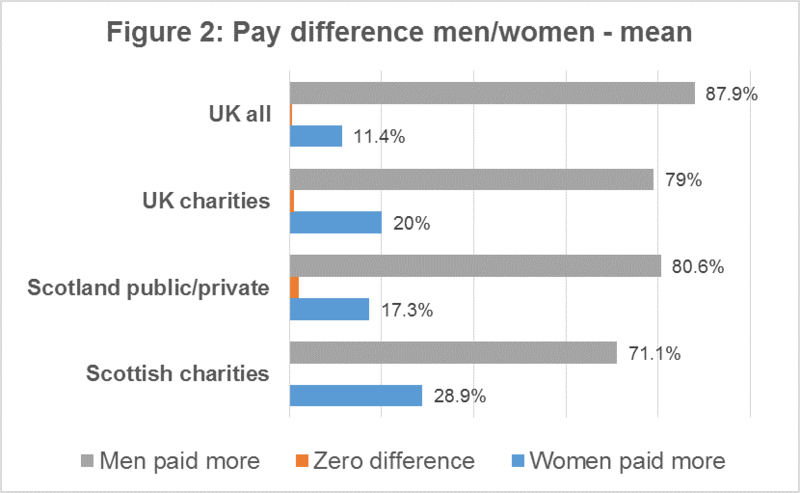 The median figures also show that only 36% of charities pay men more than women, but the figures are distorted by the large proportion reporting no median pay gap – this may warrant further investigation, as it is surprising that such a high number of charities report a 0% gap. Note that no Scottish charities report both a zero mean and median pay gap. Women represent 70.3% of the overall workforce of Scottish charities. Women in the third sector are strongly represented across all quartiles, with only small variations from the mean, ranging from 68.9% to 72.3% – see figure 5 above. There is a slight tendency for women to be under-represented in the top quartiles, particularly the Upper Middle quartile, and over-represented in the lower quartiles. However, due to small sample size and closeness to expected mean this variation is not statistically significant. We do not see the diagonally stepped pattern that characterises women in low-paid, and men in high-paid roles, showing that women in Scotland’s third sector are well-represented in top roles. With more than 4 in every 5 organisations in the UK today paying men more than women we can see that we still have some way to go to reach pay parity. We can celebrate that Scottish charities are leading the way when it comes to closing the gender pay gap. As a sector whose employees are two-thirds women that is good (if expected) news. However, the third sector is slightly behind Universities and ALEO’s and we could learn from them. 71% of the largest Scottish charities are still paying men more than women, showing that there is still some distance to go on pay equality. One priority area for the sector might be to improve the balance of genders in jobs in the Upper Middle quartile, as well as Top Quartile. So should we use the mean or the median? The mean, or average, figure totals all female employee’s wages and divides them by the number of women in each organisation, and does the same for men. The mean gender pay gap is the difference between mean male pay and mean female pay. For example, if men on average earn £17 per hour and women earn £15 then that organisation has a 12% pay gap. The median is the figure that falls in the middle of a range when everyone’s wages are lined up from smallest to largest, so the median gender pay gap shows the difference between the wage of the male employee at the mid-point of the male wage range and that of the female employee at the mid-point. The Office of National Statistics and others tend to use the median in reports, because it is closer to typical salaries and less distorted by a small number of extreme values, such as highly paid CEOs. For example, if Mark Zuckerberg walked into the room we would all become millionaires using the mean. However, the mean can be very useful in gender pay gap reporting as it can reflect problems such as a lack of women in top roles. A large difference between mean and median usually indicates inequality in the pay range.